Maybe your weight is average, but you do have difficulties around eating. Many people are living with an emerging eating disorder, yet at times, neither family, GPs, nor the individual themselves, realise that an eating disorder is present. If you are interested in an outpatient appointment, see our online ad. If you are unsure if you have an eating disorder, try taking the ‘SCOFF’ test. You will find it on our website here. Please read one true survivor’s story, which has kindly been shared with the public by BEAT eating disorder charity. Nichola, a BEAT ambassador shares her story, saying: “I was absolutely shocked to discover that I had an eating disorder”. The eating disorder in this case is Binge Eating Disorder (BED). And unlike Anorexia Nervosa, it does not always result in a person looking visibly thin. However, like all eating disorders, it does mean malnutrition, electrolyte imbalances, and serious danger to the health of heart, body and mind. And, like all eating disorders – it is an illness you can and do recover from with specialist help. At Ellern Mede we find that some people who call our Outpatients Service do so thinking that their loved one’s illness is at such an early stage, outpatient help is all they need. Sometimes it is only then, when they have our specialist assessment, that they realise in fact, their loved one’s life is in imminent danger and actually, it is inpatient care they need. Ellern Mede Medical Director, Dr Hind Al-Khairulla, explains: “Eating disordered cognition almost always involves denial. This denial can be expressed very convincingly by a person with an eating disorder. They will claim they are ‘fine’. But this is the first barrier that has to be crossed by parents, carers, GPs and other clinicians. My advice is look at the medical evidence – what blood tests tell you alongside ECGs and other vital signs. Look at the psychological evidence – what changes in behaviour that can’t be explained away just by teenage rebellion. “A second barrier is the failure to take the person with the eating disorder seriously; not only by family but by clinicians who are not experienced in eating disorders. The fact is that nobody chooses to have an eating disorder any more than anyone would choose to have viral flu. It’s not, as is often accused, ‘attention-seeking’ behaviour. Nichola found that GPs felt she was ‘wasting their time’. An important message we read in Nichola’s story is that: “If I’d known there was such a thing as BED, I know my recovery would have come a lot sooner.” And all of the above barriers featured in why things didn’t work that way for her. Firstly, Nichola thought it was pretty much a way of life – “I’d been living with these symptoms as long as I could remember”. Secondly, her attempts to find out more about the behaviour were not taken seriously – GPs did not make a diagnosis. Worse – “I met with a lot of unhelpful judgements about my weight and was dismissed as being lazy and weak-willed”. 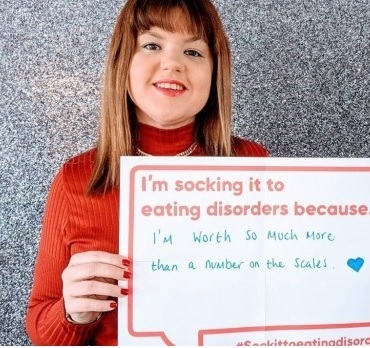 Thirdly, Nichola’s eating disorder did its best to avoid being challenged – “I hid myself away, made excuses to get out of social events and was very moody and irritable. BED really brought out the worst in me”. Thankfully, a correct GP diagnosis in 2015 and two years of specialist therapy meant a full recovery for Nichola by July 2017 and she now works as a Beat Ambassador. She wants to spread the message that BED is real and recovery from BED is possible. Dr Kiran Chitale, Ellern Mede Consultant Psychiatrist for Outpatient Services concludes: “We are very fortunate in the UK to have NHS Child and Adolescent Mental Health Services to intervene for children with eating disorders. Outpatient treatment is possible in early stages. Private outpatient eating disorder services can play a vital role is in early intervention, preventing an eating disorder from becoming entrenched, preventing medical and behavioural complications and hopefully in time, reducing the number of patients on NHS and Private waiting lists.